Spring Data is an umbrella project which contains many submodules, each specific to a particular database. 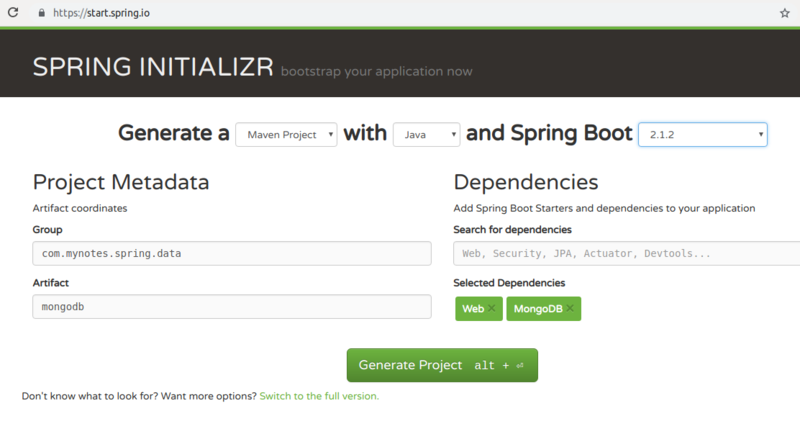 In this article, we'll be covering Spring Data MongoDB by building an application that stores and retrieves data from MongoDB, a document based NO-SQL database. If you'd like to read more about Spring Data, we've covered it in detail in - Guide to Spring Data JPA. 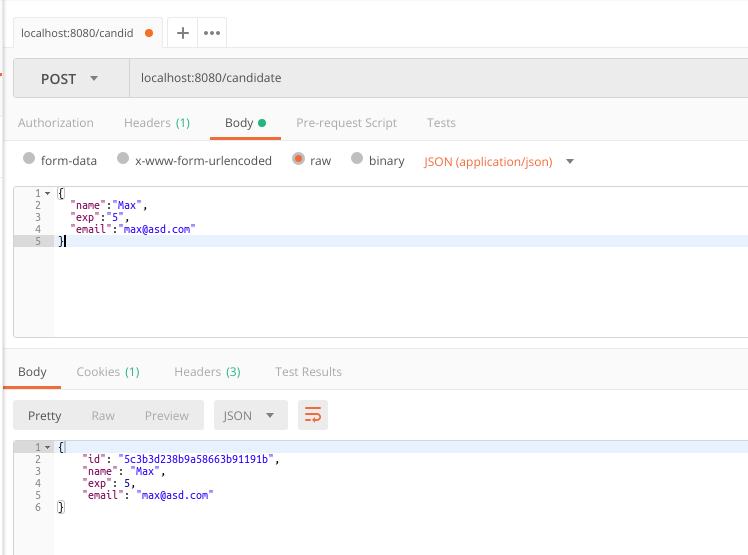 MongoDB is a document-oriented NoSQL database that stores JSON-like documents with dynamic schemas. It is commonly used for high volume data storage. Database: It is a container for collections and can be thought as similar to an RDBMS database, which is a container for Tables. Collection: It is equivalent to Tables in RDBMS, but unlike a collection it has a dynamic schema. A collection exists within a database. Document: It is a single record in a MongoDB collection. It can be thought of as a row in RDBMS. Field: A document has zero or more fields. It's like an RDBMS column having a key-value pair. To setup MongoDB server on your local machine you can download the installable here according to your operating system. You can then also download a tool like Compass for a nice GUI to interact with your server. We are now set to connect to our collection using our Spring application. After this, generate it as a Maven project and you're all set! @Document: This marks the class as a domain object that will be persisted into the database. The default collection name that is used is the class name (first character lowercased). We can map to a different collection in the database by using the collection attribute of the annotation. @Id: This marks the field used for identity purposes. @Indexed(unique = true): This is applied to the field that will be indexed with a constraint of unique. 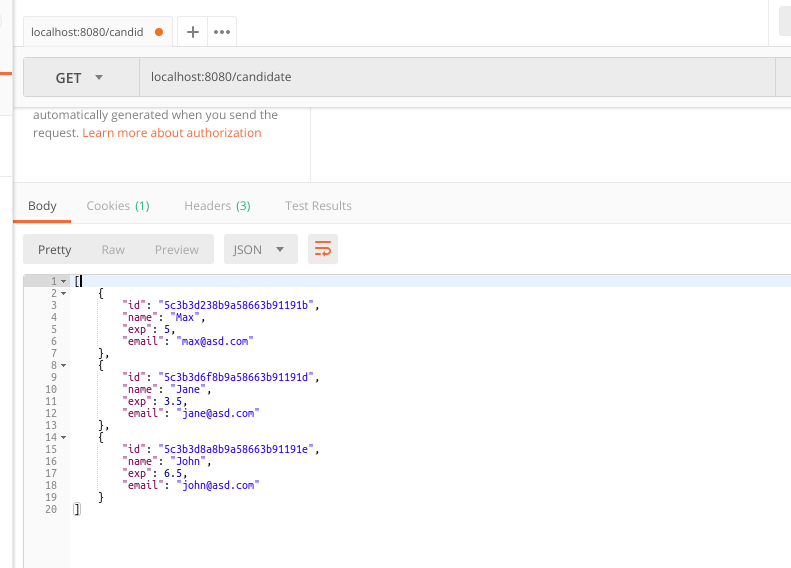 CandidateRepository extends the MongoRepository interface and plugs in the datatype of the document that we are working with, i.e Candidate and String respectively. 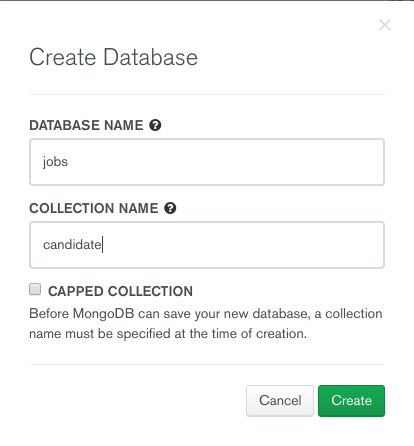 This will give us access to all the CRUD operations around the MongoDB collection. Note: If your password contains special characters then it must be URL encoded. 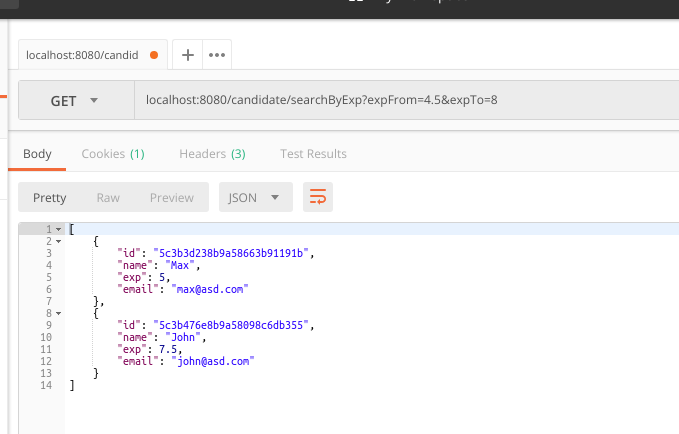 We used the save() method on the candidateRepository object. 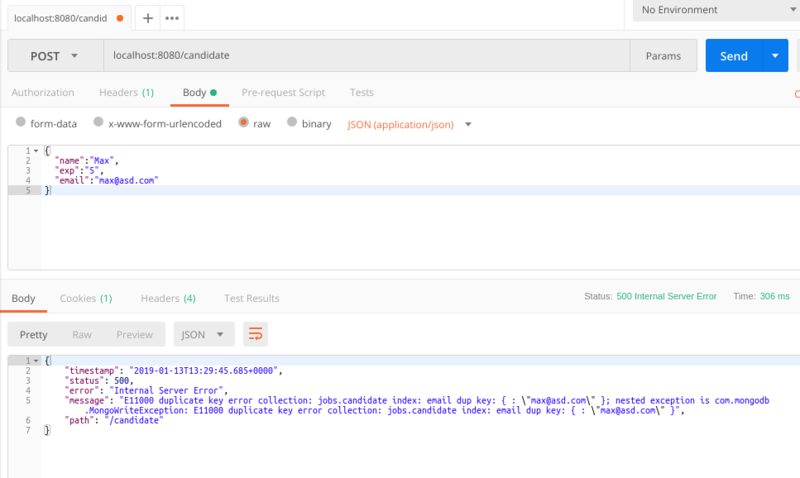 The Candidate object is captured by @RequestBody and is used directly in the save() method. Lets's create a couple of GET mappings to fetch our records. findAll() will return all the records in our database, while the findById() method will return a single record based on the ID passed. If you'd like to read more about this, we've covered it in detail in - Exception Handling in Spring. 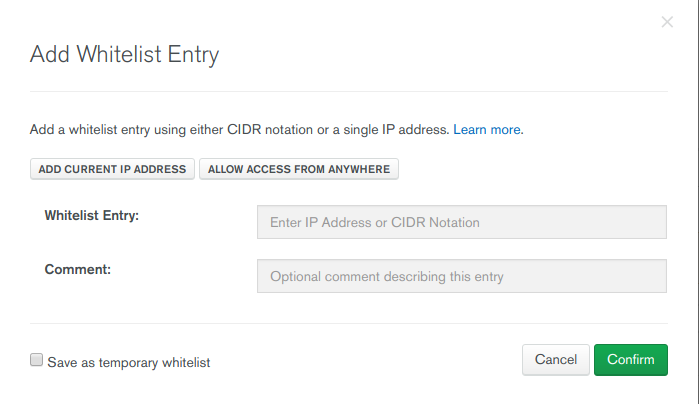 Above, we added search functionality based on email and experience. All we need to do is follow a naming convention laid down by Spring Data. After the findBy() method we write the name of the attribute in camel case, followed by any other restriction that we may want to enforce. The arguments to the method should match the where clause expectation. 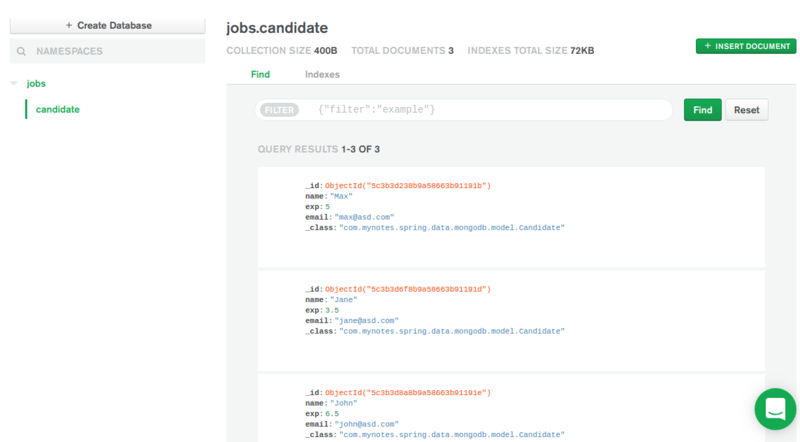 Spring Data will create actual queries for you during the startup of the application by using this interface. 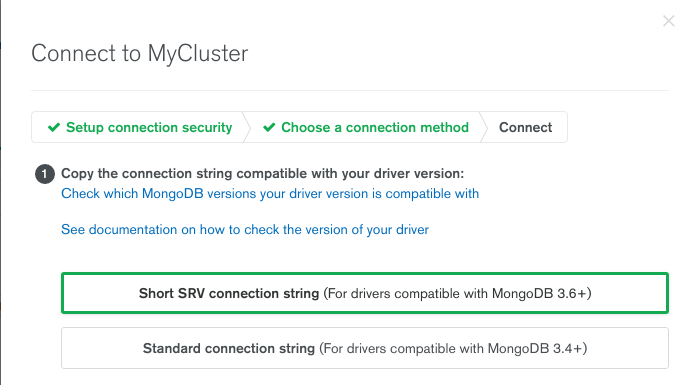 In this article, we've covered how to use Spring Data MongoDB to connect to a MongoDB server. 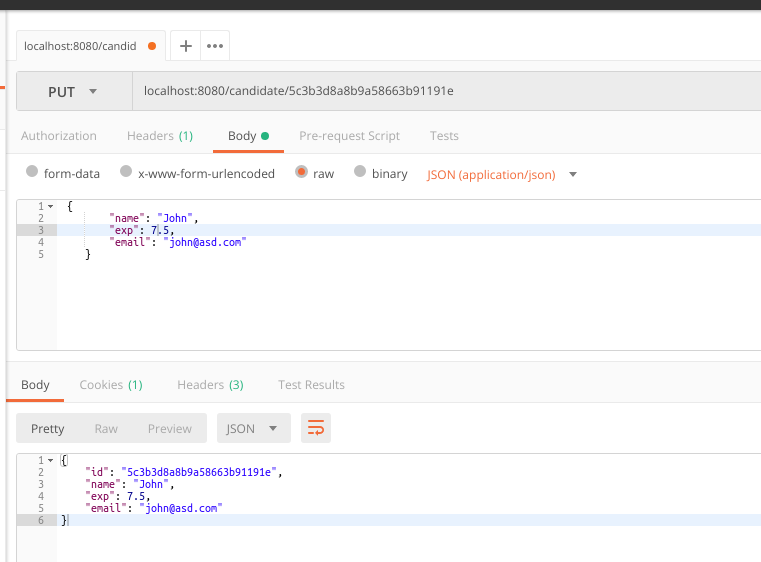 We first created a MongoDB server in the cloud using MongoDB Atlas and then used Spring Data to connect to it. After that, we performed some simple CRUD operation as well as wrote some custom queries. As always, the code for the examples used in this article can be found on Github.